K81 is a back-up ring designed to reduce the permissible sealing must be oiled with system oil. gap of the O-rings both for static and dynamic applications. APPLICATION :- All types of hydraulic cylinders, injection moulding machines, mining equipment, marine hydraulics, loading platforms, cranes and heavy duty applications. The forte of our organization is to manufacture and supply premium quality Peek Back Up Rings. When subjected to high temperature and pressure, these rings are very effective in removing the damage caused to seals and O-rings. Our entire range is designed by experienced professionals who hold years of experience in this field. 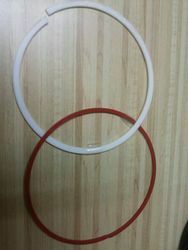 Material: Virgin PTFE, Glass Filled PTFE Etc. Keeping the variegated demands of customers in mind, our company is engaged in presenting standard quality range of Back Up Rings. These Back Up Rings are available in different sizes and dimensions as per the customer’s demands. Our product range is extensively used for industrial purposes. Backed by in-depth domain expertise, we are engaged in manufacturing and supplying of a superior quality range of Back Up Rings. These are extensively appreciated in market for their reliable performance, high tensile strength and dimensional accuracy. In addition, these are also in compliance with international quality standards. Owing to the presence of our expert team members, we have been able to offer a wide range of Backup Ring to our valuable clients. This Backup Ring is appreciated by our clients for its reliable performance and longer service life. Also, the offered ranges of products are timely delivered to our clients. 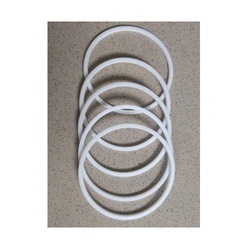 To provide added extrusion resistance Back-up rings are applied along with O-ring or seals to help them withstand high pressure without extruding and getting damaged.